Baguio (120.599E 16.409N), located in the mountains of northern Luzon a mile (1.6 km) above sea level, was the summer capital of the Philippines. It was built during the tenure of William Howard Taft as High Commissioner of the Philippines. The surrounding area has copper and gold deposits (the latter producing 1.1 million troy ounces per year during the war) and the cooler climate permits the cultivation of fruits and vegetables native to higher latitudes. MacArthur established the Philippines Military Academy here. The Japanese established a secondary military airfield here by late 1944. 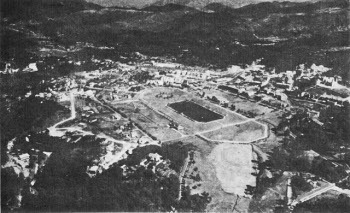 The city served briefly as headquarters of Shobu Group (Yamashita) following the American counterinvasion of Luzon, but was captured by 129 Regiment on 27 April 1945 after the near-annihilation of the defending 75 Regiment.